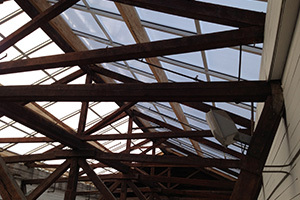 If you needed to install a new, thermally efficient skylight in a 120 year old building with sagging, structural purlins and curbs, who would be the best choice in the industry to do that kind of work? Koch Corporation is the obvious choice for building envelope improvements on a historical building! Koch Corporation, with our vast expertise and experience developed through 77 years of leadership in the glass and glazing industry, helps owners of historically significant buildings gain thermal efficiency without compromising the originality of their building. In the case of the Louisville, Kentucky TARC (Transit Authority River City) building, Koch was chosen to engineer and replace the original sagging structural purlins (the horizontal wood that held up the skylight) and curbs. This was no small feat as there was a window well which looked like the web of a drunken spider separating the art glass, visible when looking up at the ceiling inside the building, from the skylight. The bottom of the window well was 82 feet off the floor. Koch Corporation had to build special staging and install protective coverings so that this antique art glass would not be damaged during the repairs and installation of the new, nano-gel filled panels that made up the skylight. This thermally efficient skylight, made by Wasco Skylights was installed without disruption to the daily business of the train station.